On the racecourse of the Falmouth J Class regatta last weekend (June 23-27), two stunning J Class yachts had a sail tangle that could have ended badly. During a routine spinnaker manoeuvre in the last race of the J Class regatta, Ranger dropped her spinnaker as she cut across the bow of Velsheda, also mid-spinnaker drop. Velsheda then got tangled in the sail of the fellow J Class yacht Ranger. As the video above shows, the problem arose when Ranger didn’t recover its spinnaker, and the J Class yacht’s sail was tangled across the bow of its competitor, Velsheda. 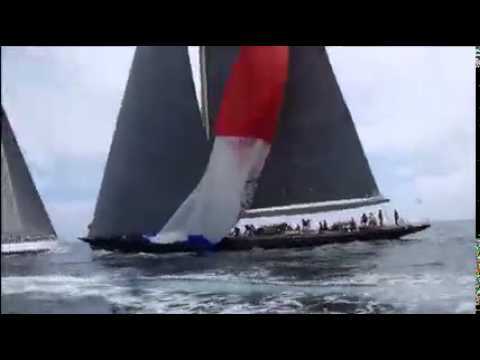 The video was taken from J Class yacht Velsheda’s RIB, shot as a coaching exercise. Velsheda, already busy pulling in its own spinnaker, tried to pull in Ranger's spinnaker as well thinking at first it was their own sail. "It was completely under our boat and it was the much safer and quicker option to keep sailing over it – even though it slowed us down from 10 to four knots," Skuodas told Boat International. "They no longer wanted [the sail], and we definitely didn't want it either!" The crew of Velsheda had to employ some fast thinking and very skilled sail recovery technique when they wound up trying to pull in two tangled J Class sails at once. In the end, it was the third J Class yacht in the competition, Lionheart, who won the regatta on overall points, with Velsheda coming in second and Ranger coming in third. Enjoying this action-packed racing is just one of the many reasons to buy a J Class yacht. The J Class yacht Endeavour is currently for sale, for instance. And get ready to spot more graceful J Class yachts on the racecourse as J Class yachts make a triumphant return to the America's Cup.